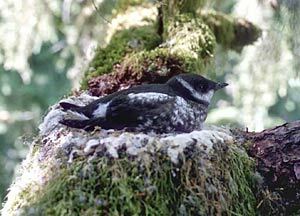 PORTLAND, Ore.— Cascadia Wildlands, the Center for Biological Diversity and the Audubon Society of Portland filed a lawsuit today in federal court charging that the state of Oregon’s clearcutting practices illegally harm threatened marbled murrelets within the Tillamook, Clatsop and Elliott state forests in violation of the Endangered Species Act. The conservation organizations are calling on Gov. John Kitzhaber to develop a plan for state forests that will adequately protect the rare seabirds that spend most of their lives on the ocean but come inland to nest and breed in mature and old-growth forests. The Endangered Species Act prohibits actions that “take” threatened and endangered species. Take is broadly defined to include actions that kill, harm or injure protected species, including destruction of habitat. The lawsuit presents evidence that logging on the three state forests, which cover nearly 600,000 acres within the range of the rare seabirds, are harming murrelets by destroying and fragmenting their nesting habitat. Although the state does survey for murrelets and establishes “reserves” where they are found, these reserves often do not include all of the habitat needed by the species, and the state still allows logging in the “protected” reserves. The state also surrounds the reserves with clearcuts, further degrading the value of the reserves to murrelets by making the trees more vulnerable to blowdowns during high winds and enabling increased access by nest predators such as jays and crows. The most recent status review of marbled murrelets by the U.S. Fish and Wildlife Service found that the birds have been declining at a rate of approximately 4 percent per year and that this decline likely relates to continued loss of habitat primarily on state and private lands. Oregon recently abandoned its decade-long attempt to develop habitat conservation plans (HCPs) for the three forests that would have given it a federal permit for limited impacts to marbled murrelets in exchange for habitat protection measures designed to enhance the bird’s conservation. Rather than improving habitat protections, the state turned its back on murrelets and other listed species altogether by walking away from the HCP process. The lawsuit seeks to force the state to develop a plan that will truly protect murrelets and the mature forests on which the birds and other species depend. Revenue from clearcutting forests supports state forest management overhead and programs, as well as county and state services. Conservation groups have long encouraged the state to pursue other options for funding county operations and schools, and to generate revenue on state forests through innovative programs.